Saturday, 3rd October 2015 at 9.45 a.m.
A light lunch will be served, followed by an afternoon tour of the gardens, led by Simon Swann. Monday, 12th October, 2015, at (9.45 for) 10.45 a.m.
Thursday, 17th March, 2016, at 10.45 a.m.
Claude will talk about some of the experiences he encountered during his research leading up to the publication of his critically-acclaimed book, Rock Landscapes: The Pulham Legacy, and Valerie – who is directly descended from the Pulham family, and is an amateur geologist and professional garden designer in her own right – talks about the buildings, landscapes and garden ornaments they created, and of her practical experiences with the production and use of Pulhamite cement. This will normally be followed by a short Q & A session, after which Claude will be available to sign copies of his book, which will be available at a specially discounted Presentation Price of £25 per copy. The Pulhams are mainly remembered today for their creation of rock gardens, ferneries, follies, and grottoes etc during the Victorian and Edwardian years. Where natural rocks were not economically available, they made their own artificial rocks by coating heaps of old bricks and rubble with their own proprietary cement, and colouring and sculpting the surfaces to simulate the colour and texture of natural rock. Their cement soon became known as Pulhamite, and the craftsmen sculptors were known as Rock Builders – but that is only part of the story! Claude’s interest in this firm stems from the fact that no fewer than five of his ancestors – including his grandfather and great-grandfather – all worked for Pulhams as Rock Builders. His research has been endorsed by several National organisations, including English Heritage, The National Trust, the Garden History Society and NADFAS, and he has been able to support a number of applications to the Heritage Lottery Fund for grants in respect of major Pulham restoration projects. Claude and Val have prepared a special video montage of pictures and photographs that, time permitting, can be run during the assembly of guests prior to the commencement of the talks. The pictures are all examples of landscapes and ornaments created by ‘The Pulhams of Broxbourne’, and help to illustrate the tremendous range of expertise and skills of which this remarkable firm was capable. When we started doing these Presentations, the groups we spoke to tended to average between about 25 to 50 people, and quoting a fee was comparatively simple. We have now started to receive enquiries from much larger groups, so we prefer not to provide a quotation before we have details of the nature of the event, and the size of the anticipated audience. As a general rule, however, we would normally suggest something in the region of £1 per head, plus travel expenses etc, so please don’t hesitate to enquire if you think our talks may be of interest to your Group – however small or large it may be. We are based in Hertfordshire, and travel expenses will obviously be on a mileage basis, which will mean that destinations beyond a certain radius could be quite expensive. In that situation, it may even be worthwhile trying to get two organisations to schedule tandem presentations in order to spread the cost. 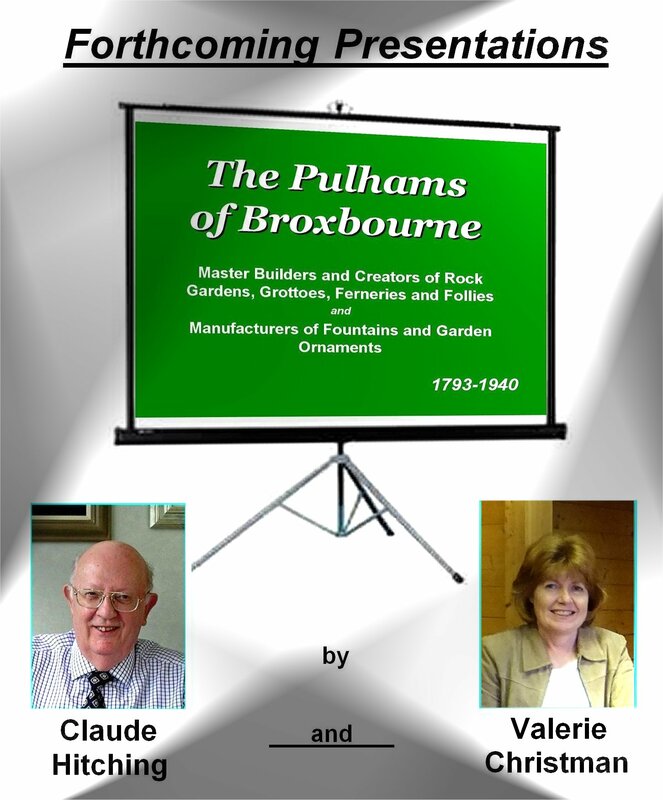 Posted on April 5, 2015 April 8, 2015 by Claude HitchingPosted in Presentation DiaryTagged 'Pulhams of Broxbourne' Presentation Diary, Claude Hitching, Valeries Christman.